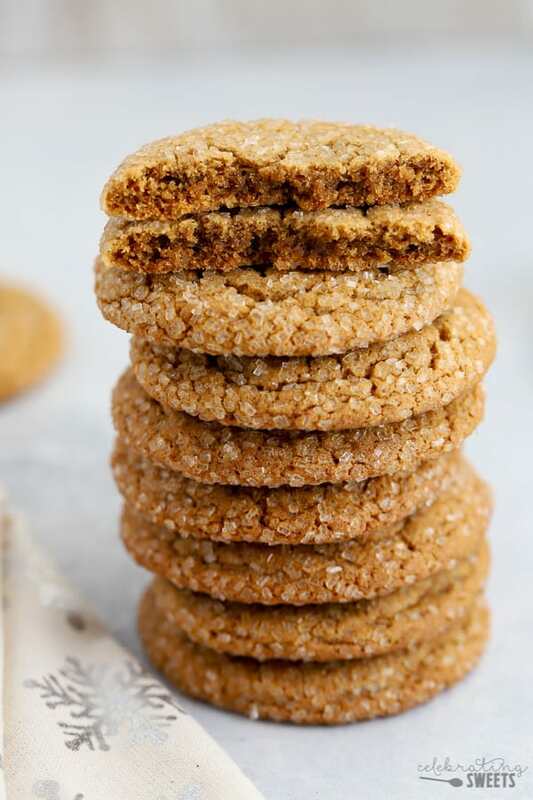 Chewy Ginger Molasses Cookies with a crunchy sugar coating and an optional white chocolate topping. 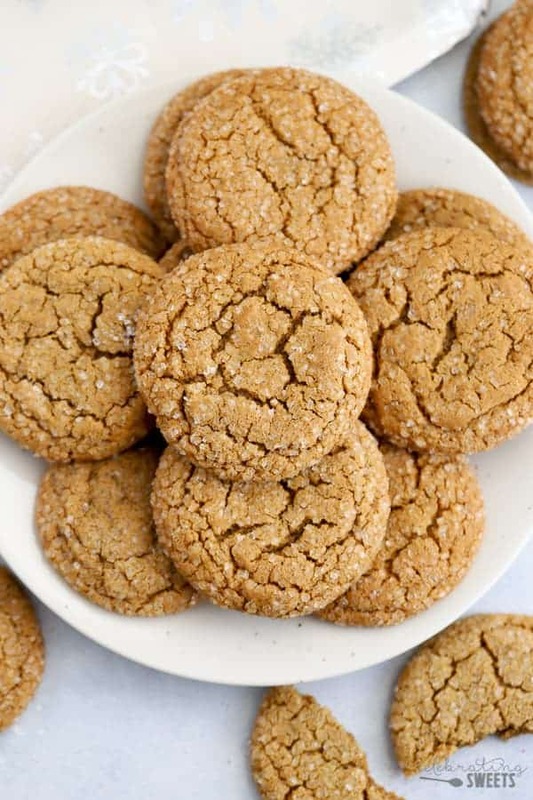 These cookies are perfectly spiced and they stay chewy for days. They freeze beautifully, too! 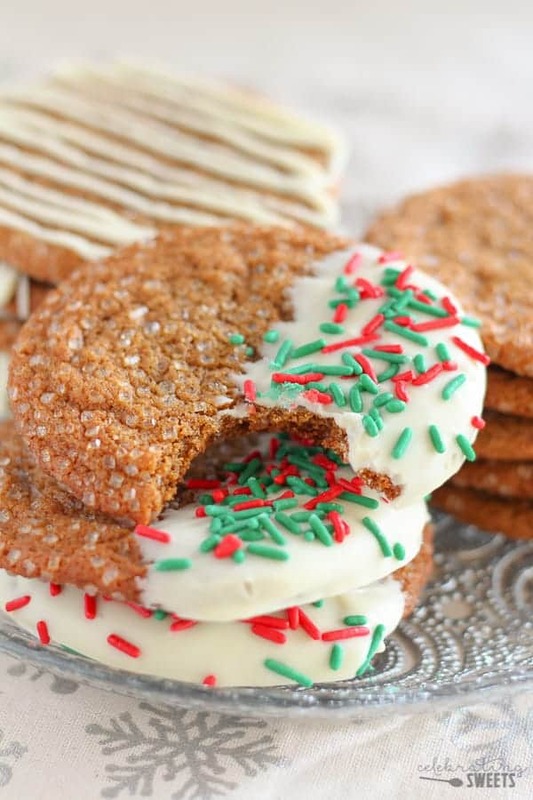 And just like that, we move on from Stuffing and Pecan Bars to Molasses Cookies and Christmas Bark! December is on the horizon, and it really is the most wonderful time of the year – HOLIDAY BAKING SEASON! My “must-make” baking list is out of control, my fridge is overflowing with butter and I just bought a 10-pound bag of sugar. I train all year for this. Let’s do it! 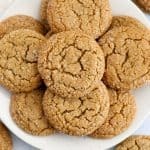 Nothing says holidays like a Ginger Molasses Cookie, and this here is the BEST Ginger Molasses Cookie recipe. BONUS: These freeze beautifully. 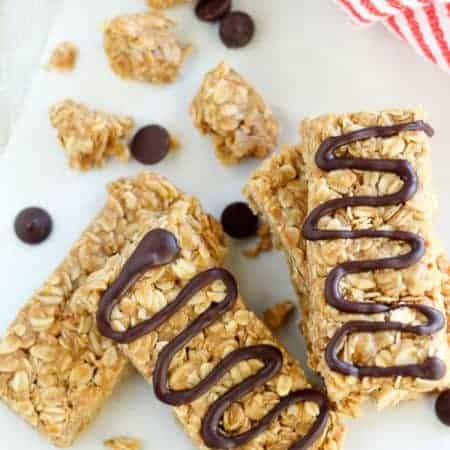 Make them in advance of the holidays and pull them out of the freezer as needed. More on freezing below. Cream butter, brown sugar and granulated sugar. Add flour, baking soda, salt and spices. Scoop the dough into balls and roll them in sparkling sugar (this makes them pretty and adds a little crunch). Optional: Drizzle or dunk the baked cookies in melted white chocolate. 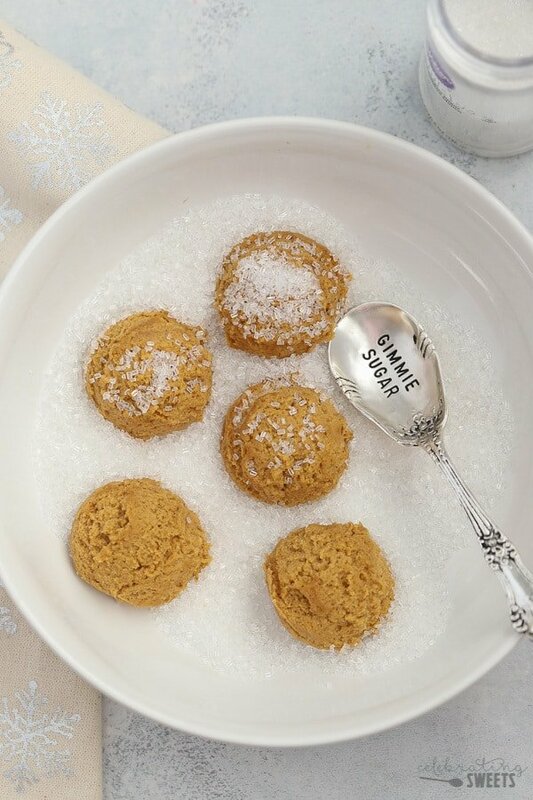 These cookies are perfectly spiced, super chewy, and they get a slight crunch from the coating of sparkling sugar. You can drizzle or dunk them in melted white chocolate, or you can leave them plain – they are great either way! 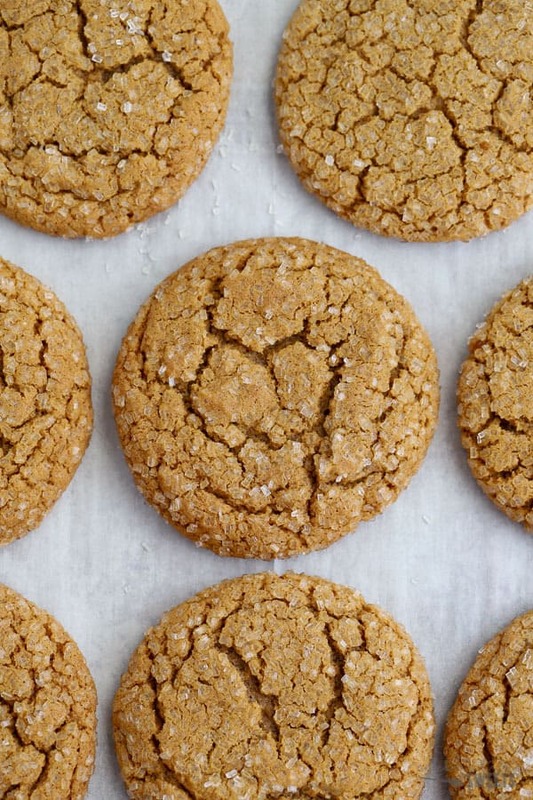 A combination of brown sugar, molasses and an extra egg yolk make these cookies SUPER CHEWY! Be sure not to overbake them, that will help maintain the chewiness, and give the cookies a soft center. Pull the cookies from the oven when they are still slightly underdone right in the very center. They will continue to bake as they sit on the baking sheet. These cookies taste just as good after weeks in the freezer as they do when they are freshly baked. To freeze these cookies: bake and cool, then package (tightly wrapped) in freezer safe storage containers. I typically double bag them in freezer bags, then place those bags in large storage containers. I have kept these cookies in the freezer for up to 2 months. Tip: If you want to decorate with white chocolate I recommend adding the chocolate and sprinkles after freezing and thawing. M&M Cookies – Soft and chewy cookies filled with red and green M&M’s. 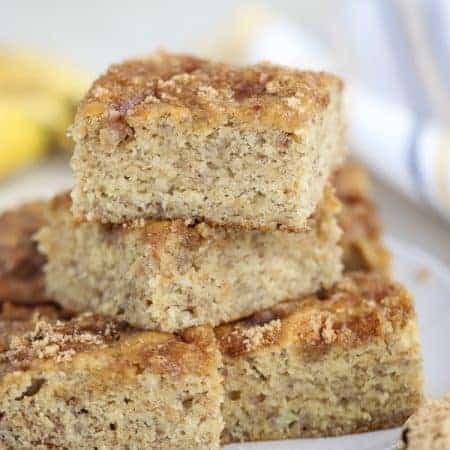 Gingerbread Cookie Bars with White Chocolate Chips – Chewy, spiced cookie bars perfect for serving a crowd. Sugar Cookie Bars – Soft and chewy sugar cookie bars topped with festive frosting and sprinkles. Way easier than making individual sugar cookies. Cranberry White Chocolate Bars – Blondie bars filled with dried cranberries and white chocolate. Everyone goes crazy for these! Christmas Bark – Easy, festive and ADDICTING! Great for gift giving. Preheat oven to 350°F. Line two baking sheets with parchment paper or silicone liners. Pour the sparkling sugar onto a plate. In a medium bowl, combine flour, baking soda, spices, and salt. In a separate bowl, beat butter, granulated sugar and brown sugar for 2 minutes, until smooth and creamy. Add egg, egg yolk, and molasses and beat until thoroughly combined, scraping the sides of the bowl as needed. Add the flour mixture and beat until combined. Scoop the dough into balls (see note) and roll the balls of dough in the sparkling sugar (be generous!). Place the dough balls on prepared baking sheets at least 2 inches apart, they will spread quite a bit. Bake for 8-12 minutes (see note). Be careful not to overbake. The center of the cookie should still look slightly underdone when you pull them from the oven. Place the baking sheets on wire racks to cool completely. 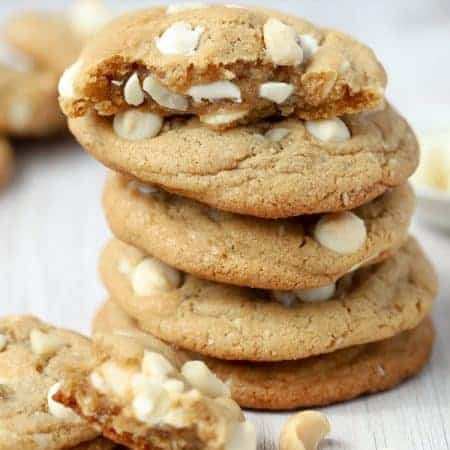 After cooling, the cookies can be dunked or drizzled in melted white chocolate. If you'd like you can also add sprinkles to the cookies while the chocolate is still wet. After adding the white chocolate I transfer the cookies to the refrigerator just until the white chocolate firms up. Store at room temperature. If the dough is too soft to roll into balls, refrigerate it for 30 minutes or so to chill it slightly. Note: The longer you leave the dough in the fridge the less the cookies will spread. For large cookies scoop the dough into golf ball sized balls (approximately 2 generous tablespoons of dough). Bake for 10-12 minutes. For slightly smaller cookies scoop the dough into 1 1/2 tablespoon portions (I use a cookie scoop). Bake for 8-10 minutes. Chewy cookies are the way to go! I also love how you decorated them! These are some of my favorite cookies to eat this time of year. Yours look absolutely perfect. The quick dip of icing is a lovely touch. These cookies looks so yummy! I’m sure this will be a big hit on our table, need to make this! These cookies look divine! Must have for Christmas table! Oh, I wish I could grab a piece right now! This looks delish!